In my younger days, I used to hang out with a group of SHARPs (Skinheads Against Racial Prejudice) skinheads from El Monte, California. We used to go to clubs, drink, share our appreciation for punk and ska music, and our mutual hatred for racist skinheads. SHARPs came in a variety of political shades. Some were self-identified communists, socialists and anarchists. Others, at least the ones I befriended, were Latino youths who, instead of getting mixed up in traditional gangs, gravitated to a more political variant. They would get into street fights with racist skinheads or would vandalize known skinheads’ houses and cars. They were a rough bunch. I remember one night after clubbing, a bunch of them went searching for a local Armenian gang with baseball bats and steel pipes in hand. That night, the Armenians beat up one of their comrades and they were looking to extract some revenge. Years later, I had another friend, a socialist and pacifist, who used to be a SHARP in Fontana, California. In the 1980s and 1990s, Fontana was known as a hotbed of Klan and skinhead activity. One day I asked him why he got out of it. He told me that, every SHARP he was friends with was now in prison for assault, vandalism or other crimes. But his conversion away from SHARP was much more personal. He told me that one night at a party, a racist skinhead pulled a gun on him and his girlfriend. Thankfully, neither he nor his girlfriend was harmed, but the incident provided him much reflection. He realized that despite their antithetical political views, he and the racists were no different. Violence made them an inverted reflection of each other. Still, knowing the different between fascist and anti-fascist skins can be a matter of life or death. How do you tell the difference? After all, both have shaved heads and wear bomber jackets, Dr. Marten boots, and jeans. So how do you tell? Look at their shoe laces. If they are red, they are anti-fascist. White means fascist. Other symbols might give you clues. Pins, patches and tattoos were other symbolic markers for where they stand. But not all self-identified Nazi skins know about the substance of “14” or really anything about Nazi ideology. “14” is just a symbol to identify themselves. There is even a word for these ideologically ignorant–Karlans. 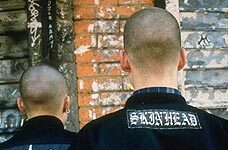 These are usually fascists younger than 16 new to the skinhead subculture. But be sure, they may not know the intricacies of fascist thought, but they do know the symbols that differentiate themselves from the anti-fascists. The problem is that these symbols of difference work best when the skins travel in packs. The mistake the two Nazis above made was not traveling in the group. Anti-fascists play their own symbols game. Many wear red handkerchiefs or shoelaces, just like my SHARP friends, to denote left wing or anti-fascism. And while their fascist enemies like the number “8”, they like “46”–“destroy fascism” and “69”–“Remember the spirit of 69”, that is 1969, when the skinhead movement was founded in Britain. Many forget that skinheads were originally anti-racist and heavily influenced by the black Caribbean communities in London. What is facsinating about all of this is that while Donskii, you, I and many others may see the differences as “almost nothing”, they are in fact enormous. Wearing red shoelaces means life or death, depending who you come upon first. But despite the enormity in meaning, the minutia of difference can sometimes produce a disorientating symbolic cacophony even among its practitioners.